With games now having been played in over 25 cities across Ireland, Australia, England, Sweden, Denmark, Germany, China, Hong Kong, Taiwan, Singapore, Japan, Canada and the USA - it seems International Rules has come late to the place which tries everything - California. As reported yesterday in major Melbourne newspaper The Age, AFL club Hawthorn have cancelled a series of clinics due to be held in Christchurch, New Zealand, after the Hawks' request for the AFL to help fund their pre-season training session was turned down. The Tokyo Goannas failed by 6 goals in their quest to win the Japan AFL premiership for the 3rd year in a row yesterday going down to the Samurais in the Japan AFL's season decider at the Radisson Ground, Narita. Final score 170 - 133. Following on from our story several days ago International players invited to AFL Camp, we now present the complete list of players attending the AFL camp. The camp is run in conjunction with the Australian Institute of Sport which gives scholarships for talented juniors. The AIS targets the best players coming out of the AFL Under-16 National Schoolboys' Championship each year. As such the Australian players will generally be younger than the internationals invited this year, although countries such as PNG will be sending boys of similar age. It appears although invitations for 15 players were sent, only 7 are attending the camp. Luke Matias is a 22 year old Englishman from Nottingham in the Midlands who represented his country at the 2005 Australian Football International Cup. He also recently completed a Business Enterprise degree at Manchester University, but has now found himself devoting his time to preseason training with Port Melbourne in the Victorian Football League. 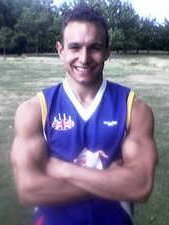 Whichever footy team he is with, Luke is renowned for his biceps, and has earnt the nickname "Crusher" - as the profiles on the Nottingham Scorpions and British Bulldogs websites show. Natural leadership qualities have often seen him in captaincy positions no matter what sport he has played. We spoke with Luke about how he came to play footy, what inspires him and where he'd like to go in the game. The AFL website currently features stories advertising a short term development officer position in South Africa through Australian Volunteers International (although the ad indicates New Zealanders are also eligible) and a story describing three Multicultural Development Positions to ensure the game's continued spread amongst Melbourne's diverse community. All positions close shortly. Samurais Michito Sakaki and Tsuyoshi Kase are heading Down Under in the hope that they may be able to cut a swathe through the opposition and make it as professionals in Australia's national game. The following article is by Ryann Connell and appeared in Japanese paper The Mainichi Shimbunon November 23, 2005. Our understanding is that the two Japanese players have been assisted in travelling to Australia with sponsorship from QANTAS, Robert Walters and members of the Japan AFL. Kase and Sakaki are pictured in action for Japan at the recent 2005 International Cup in Melbourne. The Milwaukee Bombers, a member of the USAFL competing in the MAAFL, are looking for an Australian player to play for them in the 2006 North American summer. No doubt this will be one of many in a growing exchange of Australian Football players in the years ahead as footy continues to internationalise. The following is a release from Milwaukee. The annual Australian Football League's AIS Camp sees elite young players from around Australia invited to attend a training camp in which they are put through athletic and skill tests under the watchful eye of AFL scouts. In a tremendous breakthrough for international Australian Football, 15 players from outside Australia have been invited, the first time this has occurred. PNG Exec returns to Australia but not before "Trial of the Century"
Scott Reid is well known in international footy circles for having been involved in the early days in Samoa and more recently being a key player in the development of AFL PNG. After much thought Scott has accepted a job in Australia but is confident he leaves Australian Football in good hands in Papua New Guinea. Two key issues for developing Aussie Rules around the world is ground availability and getting players involved in helping their clubs and administrators, not just turning up to play - a luxury not really available to new sports. Recently the Humber College ground used for Ontario Australian Football League finals got an upgrade, with players providing the extra manpower to assist the City of Toronto Parks in completing the job.